​Since our establishment Double Check Translation has been encouraging and supporting talented and creative young people through various competitions, as well as contributing to the well-being of our society by donating our services and products to charitable organizations and events. ​The first competition we organized was a photo competition, encouraging creative interpretation of our motto Accurate, Efficient, Flexible, with participants to express one of these ideas through their photographs. We received many great entries and were amazed with the creativity of all participants. 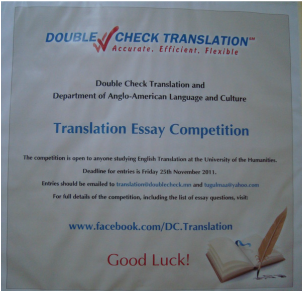 Double Check Translation initiated and sponsored the Translation Essay Writing Competition on cooperation with the University of Humanities. English translation students were given various translation related topics to write a essay on with their essays contributing to their final scores, as well as the chance to win great prizes. Through the competition, we wanted to show our ​commitment to helping the next generation of translators in their development. ​This competition was dedicated to International Translation Day (30th September) and the theme was, of course, ‘Translation’. Participants were encouraged to take photographs that showed their interpretation of Translation. We were amazed by the creativity and the many different ways that the participants saw the idea of translation. We have donated our beautifully written calligraphy of traditional Mongolian script as a prize for this quiz night, which raised valuable funds for a very worthy cause. In fact, Double Check Translation also helped Lotus Children’s Centre later on, by providing translation of their website free of charge. ​We donated this stunning calligraphy to the IET Quiz Night in 2014, which raised valuable funds for a great cause promoting educational activities across Mongolia. ​This was next in the series of ‘Translation’ photo competitions that was first organised back in 2013. Two best liked photos by our social-media audience were selected as winners after 10 creative photos were shortlisted amongst all entries. One of the exceptional entries was the ‘My hovercraft is full of eels’ sketch! ​Every year British Embassy organizes a little Christmas party. Double Check Calligraphy donated a beautiful piece of calligraphy for the charity draw. ​We not only offered our calligraphy as a contribution, but our staff actually participated in the event, spending a fun time with other supporters of the event. Double Check Translation has played an active role in the business community in Mongolia, donating prizes and assisting in the organisation of many networking events in order to encourage greater links between organzations and companies in Mongolia. ​We donated our special Halloween calligraphy for the brilliant fundraising event organised by Mexikhan restaurant. The night raises much needed funds for the Milkyway Project initiated by the Rotaract Club of Nairamdal. ​The British Embassy held a fundraising event to help the natural disaster victims in Nepal. We donated our calligraphy for the draw for this event and the winner of the calligraphy was very pleased with our beautiful piece. ​This calligraphy competition was organized amongst students in order to support and encourage young calligraphers. There were four entries shortlisted by Double Check Translation. The shortlisted participants were given a specific text to write and two of them were selected as the competition winners. The highlight of this competition was talented 13 year old Erkhbilguun, the second winner. ​Lotus Children’s Center is a home to over 150 kids and has been operating for over 20 years. When they approached us regarding this bilingual version of website need, we enthusiastically offered to complete the translation for free of charge. Keep Mongolia Beautiful is a Facebook page that integrates volunteers who truly wish to keep Mongolia litter-free. Double Check Translation has completed the translation of the page into Mongolian and our staff also participated in the Cleaning of Terelj National Park. Our calligraphy project held a calligraphy photo competition to help raise the profile of the beautiful and amazing traditional Mongolian script. The winners won a beautiful piece of calligraphy.